A full smile is beneficial to not only your confidence but your oral health and jaw function. or those who are missing teeth, finding the right replacement option is essential. At Lakeside Family Dentistry, Dr. Seppi and his staff provide dental implant restorations and implant-supported dentures to patients throughout Windermere. If you have ill-fitting dentures and are looking for a permanent solution to missing teeth, contact our practice today! There are a variety of benefits dental implants provide for patients with missing teeth. Unlike traditional restorations, dental implants supply stable support for dentures and promote overall oral health. Jawbone density is a key component of aesthetics and function. Tooth roots are the foundation of healthy bone volume. When the roots are lost, dental structure recedes and causes your chin to shrink, resulting in a puckered upper lip and deep wrinkles. Traditional restorations may replace the tooth, but not the tooth root. Over time, restorations and dentures must be adjusted to fit your changing jaw shape. Depending on the rate of your diminishing bone density, ill-fitting dentures can make chewing and speaking difficult. Our Windermere implant-supported restorations integrate with the tissue for a more stable support for your replacement teeth. Implant treatment enhances your jawbone health, maintains your desired aesthetics, and restores your smile. 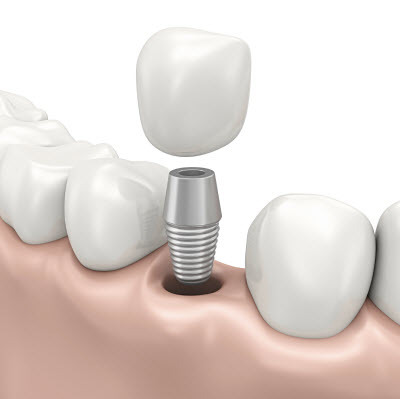 At Lakeside Family Dentistry, we work with trusted specialists for placement of dental implants. For over 10 years, Dr. Seppi has perfected the skills necessary to create restorations that look and feel like natural teeth. Whether you have one missing tooth or a full arch, we customize your treatment plan to your specific needs. We work with conventional implants as well as mini dental implants to ensure all patients, even those with inadequate bone density, can receive this permanent tooth replacement. Your treatment plan is arranged by Dr. Seppi and we collaborate with your specialists to ensure an efficient procedure. Implant retained dentures and All-on-4 treatment are perfect for those with adhesive dentures on their lower ridge that become uncomfortable and ill-fitting over time. They provide the stability needed to keep the dentures in place while ensuring the prosthetic feels natural. Our implant restorations are fabricated with aesthetic materials to ensure a seamless enhancement to your natural smile. Stabilize Dentures with Implants at Lakeside Family Dentistry! Dr. Seppi and his team work diligently to provide quality dental care and renewed jaw function. For more information about our implant-supported restorations and dentures, contact our Windermere dental practice today!